The International Day of Peace student observance at the United Nations began in 1997, when the Education Outreach division of the Department of Public Information (DPI) decided to invite local students to observe five UN-appointed days, including the International Day of Peace, then marked on the third Tuesday in September, the annual opening day of the General Assembly. 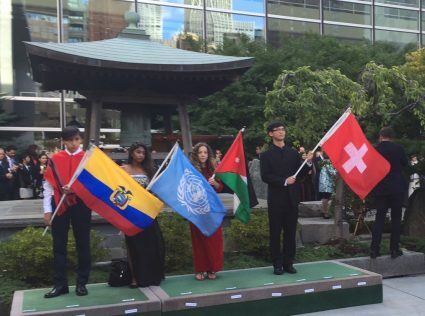 The World Peace Prayer Society’s UN Representative offered a World Peace Flag Ceremony with the Middle School students raising the flags of all the Member States. DPI agreed to try it, and from then on the World Peace Prayer Society and Pathways To Peace were NGO partners in planning this event each year, later joined by the United Religions Initiative and the Jane Goodall Institute. Over the years, the NGO partners worked with DPI on the annual theme and helped outreach to schools and entertainers. The NGOs also encouraged DPI to invite the Secretary-General into the student event from his ringing of the Peace Bell until his presence and that of the celebrity Messengers of Peace in attendance became a regular feature. They also succeeded in getting the UN to invite the students to offer short presentations on their own peace projects, which is always inspiring. 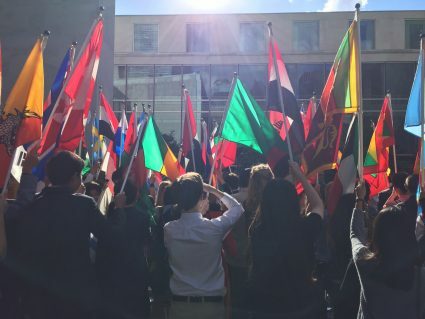 And they asked for the students to be allowed to carry the flags outside to where the Secretary-General rings the Peace Bell. In 2016, the 20th student observance of the International Day of Peace at the United Nations took peace to a whole new level – literally. 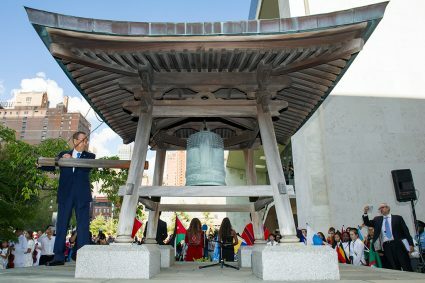 After raising the flags high at the UN Peace Bell, the students processed in to their event, which was held in the prestigious General Assembly Hall! 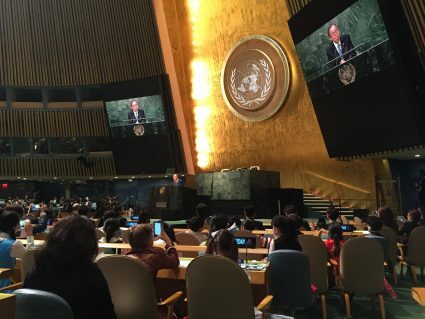 After a rousing hip-hop presentation of the 17 Sustainable Development Goals, Secretary-General Ban Ki-moon addressed the students and asked them to become champions of the Global Goals. The President of the 71st General Assembly also spoke. Then it was time for the Messengers of Peace. Actor Michael Douglas then took on the role of M.C., and then showed a video on disarmament. 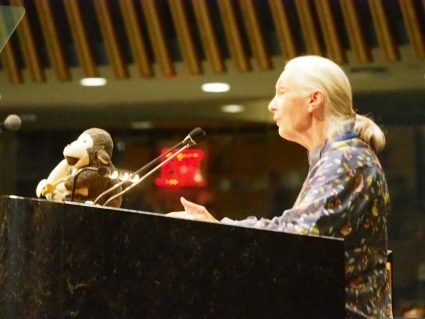 Dr. Jane Goodall spoke touchingly about the need to preserve the natural world. 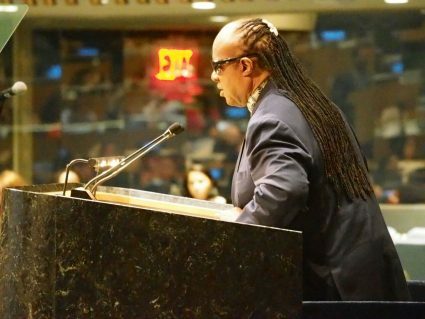 Stevie Wonder told of overcoming his disability to reach millions with his music. 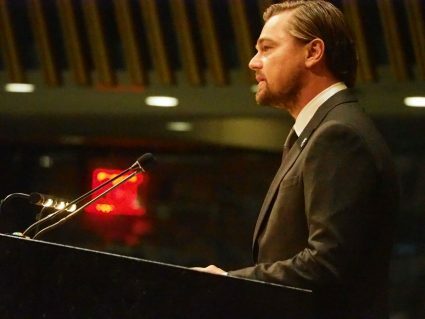 Leonardo DiCaprio – a favorite with the students – showed a trailer for his new film about climate change. And Midori played a stunning piece on her violin, before explaining the importance of giving children the experience of living arts. 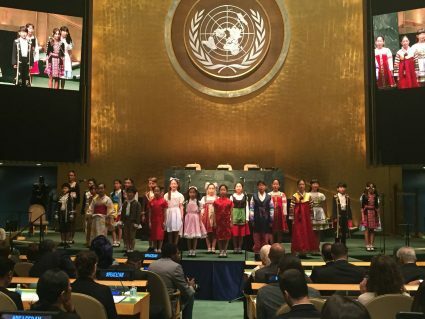 Following the introduction of the Global Teacher Award honoree, Ms. Hanan Al Hroub of Palestine, all were treated to a beautiful series of songs performed by the Rainbow Choir of children from the Republic of Korea, which was very warmly received. But that wasn’t all! There were three Nobel Peace Prize laureates to speak to the youth about their passion for peace: Ms. Tawakkol Karman of Yemen, Ms. Leyma Gbowee of Liberia and Ms. Shirin Ebadi of Iran. As youth moderator Dena Mekawi took the podium, there were video links to the UN Peacekeeping missions in Cyprus and Liberia, as well as a student presentation from Rome. 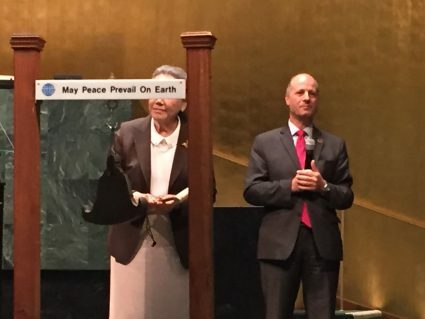 Then six students offered brief presentations of their own peace projects, after which Mrs. Ban rang a peace bell inscribed with “May Peace Prevail on Earth” for a 12 noon Minute of Silence, as she has each year of her husband’s term as Secretary-General, which concludes this year. 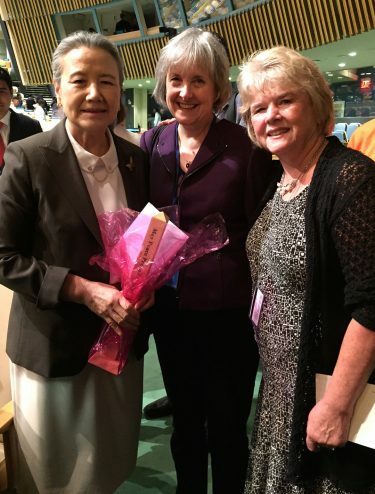 Following the event, Deborah Moldow and Monica Willard presented Mrs. Ban with a desktop Peace Pole in recognition of her dedication to the students and to peace. This spectacular morning of peace ended on a high note with the students being led in a chant of “SDGs – Building Blocks for Peace!” They will not forget their visit to the United Nations – where peace was celebrated at the highest level.